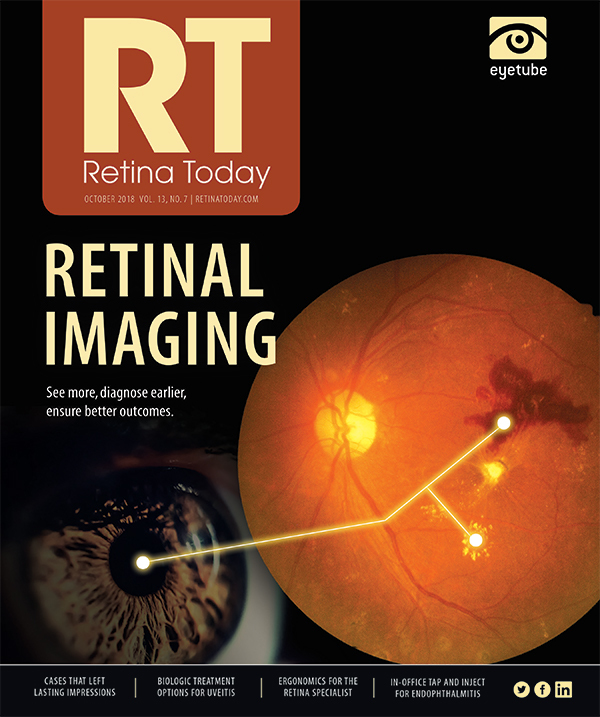 Retina Today’s choice takeaways from this issue. For many of us, as the cooler weather of autumn sets in, we begin preparing for the hustle and bustle of the end-of-year meeting season. We know it’s coming, and we plan accordingly. The Retina Society’s annual meeting recently took place, and, while some of us were pinched for time in order to stick to our travel itineraries, others had to make the call to miss flights and/or skip giving talks so that they could evacuate or brace for the arrival of Hurricane Florence. Sound familiar? This time last year we recapped the damage and devastation caused by Hurricanes Harvey, Irma, and Maria that affected our friends, families, and colleagues in Texas, Florida, and Puerto Rico, respectively. Earthquakes were reported in Mexico during the same time period. We wish we could look back at last year and marvel at the anomaly of those natural disasters, but then we have Florence, Typhoon Mangkhut in the Pacific, and wildfires in California tapping us on the shoulder. The thing is, none of us is immune to being thrown off our game due to a freak accident or natural disaster. That’s why having some sort of plan in place is crucial. What would you do if a tree fell on the roof of your office or you lost power or got flooded? The key is learning to be adaptable and resilient. Not only will these skills help us in daily life, but they will also benefit us professionally—for example, in the clinic when dealing with a patient who changes his mind about treatment or in the OR when a complication arises. Being able to adapt is important at the time the stuff hits the fan, and also afterward, when adjusting to a new norm is necessary. If you need some inspiration here, just think about your patients. So often we need them to be understanding and flexible and to adapt to their diagnoses and treatment regimens. If they can do it, by golly, so can we. In the end, this resilience and adaptability makes us all stronger. If you have been affected by a natural disaster or other unfortunate event and would like to share your story, email us at RetinaEditors@bmctoday.com.